Just Looked back through my shots and i see it's nearly 13 months since I last posted anything from a normal work day. A lots happened in that time. I was Runcorn Relief covering South Liverpool out to Runcorn, Halton Junction and Greenbank. Runcorn has gone, Halton Junction has gone, raised to the ground, Speke Junction has suffered the same fate and Allerton Junction after one final hurrah acting as the terminus for a lot of the Lime Street services during the resignalling work has also closed, it now stands forlorn awaiting its fate. I decided it was time for another move. I am now Winsford grade 6 GPR covering all the Crewe boxes (except the PSB), Winsford, Greenbank and Plumley West. It's a cracking patch with lots of variety. I really ought to catch up on the boxes I've left behind but for now here's three of six shots from my Saturday just gone at Salop Goods Junction on the Crewe avoiding lines. I actually passed out the fantastic Salop Goods Junction on the 23rd November last year (2018) then after a couple of shifts I'd not returned since. It's a lovely box dealing with the freight that avoids the station. The Liverpool, Manchester and Chester Independent lines converge here then four lines link this location to Crewe Sorting Sidings North. Up Fast and Up Slow Independent lines and similarly the Down Fast and Down Slow Independent lines. 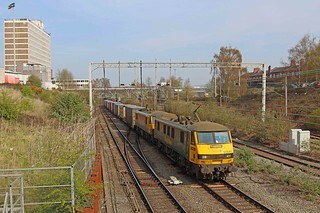 The other pair of lines heading south are the Up and Down Salop which head right towards Gresty Lane Junction and Shrewsbury. Here we see a couple of Freightliner services on the morning of Saturday 6th April 2019. 90041 & 90042 lead 4M27 the 0525 Coatbridge - Daventry off the Down Liverpool Independent and onto the Up Slow Independent faithfully observing the 10mph speed limit. At 10.32 the service is 4 early. It is booked to sit in Basford Hall yard for 16 minutes before continuing it's journey South.